1. Put the flours, salt, butter and water into a bowl and gently mix to an even dough with your fingers. Transfer the dough to a lightly floured surface and knead for 5 mins until smooth. Shape the dough into a square, wrap in cling film and chill for 1 hour (or freeze for 20 – 30 minutes). 2. For the butter layer, cream the butter and flour together. Sandwich the mixture between 2 sheets of cling film and roll out to a rectangle the same width as the square of dough, but twice as long. Chill in the fridge for 25 minutes. 3. Place the chilled butter sheet, short end facing towards you on a lightly floured surface and place the square of dough in the centre of the butter sheet. Make sure it is positioned neatly and covers almost to the edges. Lift the exposed butter sheet at the top and fold it down over the dough, then fold the exposed butter sheet at the bottom up over the top, so the dough is completely enclosed in the butter sheet. 4. Place the dough on a lightly floured surface, short end towards you. Roll out to a rectangle, keeping the edges as even as possible. Fold the top quarter down and the bottom quarter up so they meet neatly in the centre. Then fold the dough in half along the centre line. This is called a book turn. 5. Remove the dough from the fridge and make another book turn. Wrap the dough in cling film and chill for 25 minutes. 6. For the filling, mix the granulated sugar and the cinnamon together in a bowl. On a lightly floured surface roll out the pastry to a rectangle as before and sprinkle over the sugar. 7. 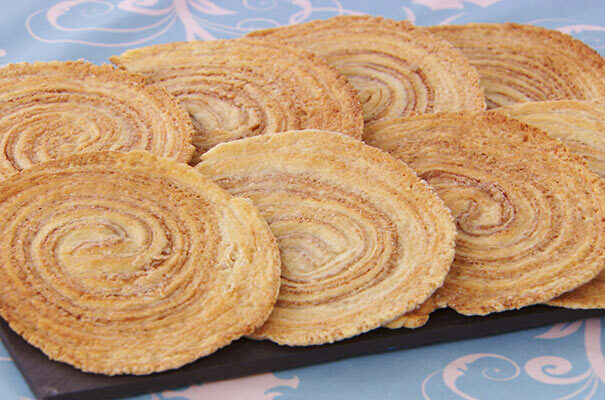 Make another book turn to incorporate the sugar, then roll out the pastry 1cm thick, to a rectangle 12cm x 20cm. Roll up the pastry from the short end like a swiss roll. Wrap in cling film and chill for 25 minutes. 8. Heat oven to 200C/fan 180C/gas 6. Trim the ends of the roll and cut into 8 x 1cm slices. Dust the work surface heavily with icing sugar and roll each piece of dough out very thinly, turning to coat in the sugar and to prevent sticking. 9. Place the biscuits on 2 baking sheets lines with silicon sheets and bake for 5 minutes. Remove from the oven, carefully turn the biscuits and cook for a further 3-4 minutes until golden. Transfer to a wire rack to cool.